Just a short update this week... as it's the bank holiday weekend and I'm trying to carve out some rest/relaxation time for at least part of the weekend... it's actually quite a challenge when I know there is so much work I should be doing. 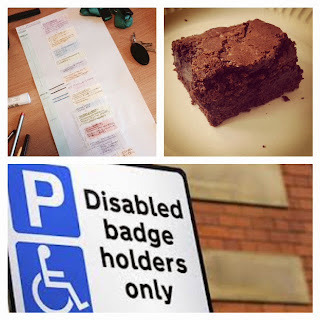 This week included a chance to have a go at assessing people for blue badges which did give me more of a chance to think 'anatomy' when assessing walking abilities which was a positive one. I'm thankful to be around a great bunch of OTs on placement that give me opportunities to experience new assessments and add to my knowledge whilst I'm there. I also have been focusing on my case stud this week and comparing the OT process for this individual against the linear OT process in theory - Gave me a chance to be colourful as a way to help me understand the loops that appear in practice during the process! I also had a chance this week to spend some time with the physiotherapists and prosthetist (specialist in prosthetic limbs), that focus on amputee rehab at the hospital which was a really interesting morning, if anything I wish I could have spent more time there as I left which a million more questions. It's such an interesting area. One more week of PP2 left! !